For years my wife worked in the restaurant business once summer hit. Year after year, our schedules would switch from early morning work to the late night hustle. We would work hard to bring the best possible service and experience to vacationers in high-end restaurants. We would crave our end of the night pasta dinner as we would sit on crates as we sat and took a breathe of our own summer air. When our shift was over, we would tightly fold our tips for the night as we hopped in my no-door jeep as we rushed home to take our shoes off and relax. Fast forward to 2012, when our life changed with the birth of our beautiful, "more personality in her little finger" daughter, Payton. The late night shifts, and side hustle wouldn't fit our lifestyles, however our bills stayed the same. 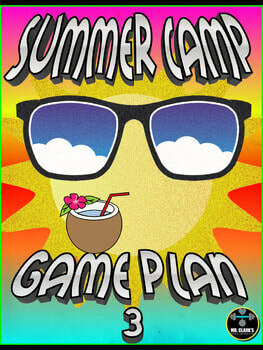 Enter Game Time Summer Camp! A camp that I started that same year to help supplement our income. My wife and I worked in a hot gym, instead of a linen-filled, air-conditioned, wine-scented atmosphere and boy did we have a blast. In our profession, many of you work summer jobs to fill the gap of a few months without an income. You utilize your skill-set and opportunities where you live to survive. The camp I started was just that. I took my skill-set of teaching and fitness and brought a fun, engaging, and meaningful experience for kids to life. With that being said, this page is dedicated to all of you that work hard in the summer. Below are a few camp-specific resources I have created to help those of you who work at camps a little easier. Keep up that side hustle, and find what you love to do!